Барааны дугаар 9780199594009. Categories: Dictionaries, OXFORD. Forensic scientists apply scientific analysis in a legal context and play a vital role in solving crimes. Sometimes the collection of forensic evidence is the only way to establish or exclude an association between suspect and victim or crime scene, or to establish a likely order of events. Profiting from recent scientific developments and the advancement of technological equipment, forensic science is a rapidly evolving discipline that encompasses many sciences and the law. 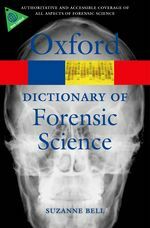 This dictionary covers in over 1300 entries the key concepts within forensic science, including a wide array of relevant specialist terms from areas such as chemistry, biology, anthropology, art, engineering, firearms, toolmarks, trace evidence, crime scene investigation, case history, biographies of investigators and criminals, as well as forensic computing. Ranging from crime scene to fibers and fluorescence to RAM, this new dictionary is the most up-to-date of its kind and is international in scope. Entry-level web links to online resources are listed and regularly updated on a companion website, expanding the scope of the dictionary and pointing to more in-depth supplementary material. Many entries are complemented by case examples (Dr Crippen, Mary Ann Cotton, etc. ), figures, and photographs, which makes this A to Z an ideal reference for students of forensic science, as well as professionals and those with an interest in forensics. Readership : Students and practitioners of forensic science; students of related disciplines such as chemistry, biology, psychology, law, law enforcement, and criminology; those interested in forensics.